Folks, I know this is late notice but sometimes amazing things come together pretty quickly. Tonight (Sat) at 7:30 p we are really proud to host two entrepreneurs, Lisa and John. 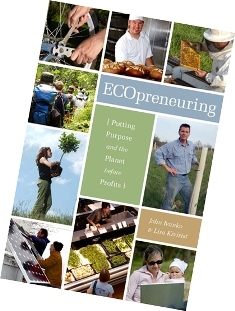 Actually, Lisa and John call themselves ecopreneurs – putting purpose and planet before profits – big hmmm! For all you die-hard capitalists, small business owners, emerging entrepreneurs and consumers, I think the discussion tonight will have an amazing ability to enlighten and create a path for alternative perspectives and thinking. Interestingly, this weekend I am working on next year’s budget and strategy for 2009. We have spent the last year and a half trying to adjust our business model to buy local, along with evaluating our environmental impact while trying to deliver exceptional quality and paying the bills. There are not very many business models out there to follow, but Tazza D’Oro is lucky to be surrounded by businesses who have taken the plunge long before “green was the new black”. Batdorf and Bronson, Turner Dairy, Penn’s Corner and Buy Fresh Buy Local are some of our partners and have helped to show us the way through. Please check out their web sites – ok.
Lisa and John, we are so excited to meet you and hope we become ecopreneur peeps! Might this be the “green” lining for some of our current economic challenges and a path to sustainable opportunities!